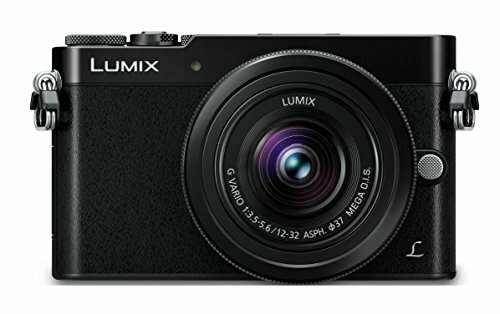 Panasonic rules the roost when it comes to dinky compact system cameras, with 2013's Lumix GM1 establishing a strong position in the market. How to update such a seemingly perfect pocketable interchangeable lens camera? Plonk a viewfinder in it and add a hotshoe, that's how, which is exactly what we get in the Panasonic Lumix GM5, a camera designed for the more demanding photographer. But the extra tech means the GM5 brings with it a bigger footprint than its predecessor. At first glance the front-on face looks similar to the original, and it could fool you into thinking it's a compact camera - indeed it's dimensions are smaller than the high-end Panasonic Lumix LX100. With all that in mind, is the Lumix GM5 still a mini yet mighty offering for those seeking top-end picture quality on a smaller scale? We've been shooting with the Lumix GM5 for a few weeks to see whether it connects as astoundingly as the original, or feels outdone by its rivals, both compact and compact system. For this review we received the GM5 with the 12-35mm f/2.8 lens (in among some others), which frankly felt at odds with the camera. First, the lens in this instance is the more expensive component than the body; second the scale of such an optic dwarfs the body and makes it feel a bit like one doesn't belong with the other. They do, of course, which is part of the point of having an interchangeable lens Micro Four Thirds camera. However, as with the original GM1, pop the 12-32mm kit lens on, which is far smaller, and there's a sense of compact camera about the GM5 that's really great. Indeed, we suspect many of its owners will never swap out the lens, or perhaps instead opt for a small-scale prime (there is a £899 15mm Leica kit option), despite the full spectrum of Micro Four Thirds optics being available. Small is desirable, but the GM5 is close to the limit of what works. To the rear the four-way d-pad - which has ditched its embedded rotational dial control, now with a separate thumbwheel to the rear, making use of the additional height in the design - is positioned rather close to the LCD screen. Playback and function buttons sat next to the new thumbwheel are better spaced apart, but are still designed for small fingers. Despite squeezing an electronic viewfinder into the mix, the GM5 is still a camera that fits in the palm of a hand. It successfully pairs touchscreen controls with a physical mode dial and drive mode dial, each tweaked compared to their respective GM1 equivalents. The only issue with the touchscreen is the same we had with the GM1: the buttons are so close to screen's edge that some accidental presses aren't always out of the question. All in all, the size difference between original GM1 and then GM5 isn't hugely significant. The viewfinder protrusion adds 5.7mm to make a 36mm depth, while the height increases by 5.4mm to 59.5mm in total, and given those figures the 211g weight without a lens attached - a mere 7g more than the GM1 - is impressive. Given that the GM5 is still smaller than the fixed-lens LX100, it's a camera that positions itself as a viable alternative to that very compact camera. Even the Fujifilm X30 is chunkier. The faux leather finish of the GM1 - which we've slated before and often moan about similar materials in Samsung smartphone products - is now a thing of the past. The GM5's subtle texture to the front is a far more appealing and sophisticated look. The inclusion of a viewfinder is a logical addition to the GM family, but sometimes logical doesn't always feel absolutely right. We didn't often use the finder, as its 0.46x (equivalent) magnification doesn't produce the largest of preview screens out there. The 1,166k-dot resolution is up to scratch, though, and the eye-level sensor can be set to automate between finder and screen preview, yet in low-light there is visible ghosting lag which is a distraction. Within the same footprint Panasonic could have added the hotshoe for a viewfinder accessory option and added a slim tilt-angle screen instead, which might have appealed even more. Or perhaps that's the half-way GM3 that we just created in our minds. The point is, we suppose, it's about choice: if you want small with a finder then the GM5 makes sense, but it backs itself into a bit of a corner as the older and now cheaper Lumix GX7 is a similar model on a larger scale. The GM5's finder isn't the out-and-out success we had perhaps thought it was on day one. The 3-inch, 921k-dot LCD screen to the rear of the GM5 is by far and away how we used the camera most. Although that's taken a resolution cut compared to the GM1's 1,040k-dot panel, presumably for the sake of the viewfinder, which isn't a very welcome change overall. However, the display is 50 per cent brighter than before, which just about redresses the balance. We also had our first review sample GM5's viewfinder get damaged in the overhead locker of an aeroplane, its exterior finder panel getting knocked off, which is something we've not had happen to a camera before. Bad luck, but the GM5 doesn't like to take a knock. Small in scale, yet with plenty of performance depth and speed, the GM5 is a capable little camera. A top favourite of ours is the Pinpoint autofocus mode, which zooms in to the focus area to 100 per cent scale so you can see that accurate focus has been made exactly where you want it. Does what it says on the tin. Paired with the touchscreen it's a perfect companion and something we used often to snap elk, deer and a variety of animals, including a peacock that took it upon itself to peer through the window on Christmas Day 2014, while on holiday. The only downside is that the outer edges of the screen aren't available for autofocus, which can feel limited in its centralised approach. The already speedy GM1 offered a 120 frames per second refresh rate; that's 120 instances in any given second to derive focus. The GM5 doubles that to 240fps, therefore being yet more adept to quickly zip a given subject into focus. Panasonic claims 0.06-seconds (with the 14-140mm and 14-42mm lenses) but, frankly, it's so fast that anybody would struggle to notice the difference between the two. Set to single autofocus the Panasonic system is up there with the best when in terms of speed. It's near instant to focus. Dim conditions pose no issues either. We've been able to shoot at night, assuming some degree of a light source present, however subtle that may be. Set to ISO 6400, the interior building of a fire-lit lodge was no problem for the GM5. The exception to autofocus ability, as with so many compact system cameras, is when shifting the top dial to continuous autofocus (AF-C), which sees the camera a little slow in updating its current focus position. We still can't name a single compact system camera that can take on a quality DSLR and track a subject in real time with as much success, although the Samsung NX1 and Panasonic GH4 are trying to close that gap. The other downer is battery life. It's an ongoing issue in small cameras such as this, but with the addition of a viewfinder to cope with the draw on battery sees around 200-shots per charge as far as the GM5 will get you. And that's at a stretch. The official stance is 220 per charge, but we can't help but thumb through images on card and fiddle around with settings during use, all of which impact battery life and saw us shooting under 150 shots in a single charge. Panasonic seems to have settled on the sensor found in the GX7 as its go-to 16-megapixel offering, as that's what appears in both the GM1 and GM5, among other models. There may be tweaks and adjustments at play - there has to be given the Venus Engine and its 240fps refresh, as touched upon earlier - but if you have experience of the GM1 then it's much the same to be found here. Which is no bad thing. We're not talking total imaging perfection, as the colours are sometimes a little on the cool side and metering has a tendency to slide towards slight underexposure in our experience (this is likely due to overcast skies and icy ground colours throwing proceedings off the scent), but it's a generally good all-round show. With the 12-24mm f/2.8 lens we didn't feel as though we were using a compact camera, but the results from this optic impress, more so than the 35-100mm f/4.0-5.6 tele zoom we also utilised for a couple of days. When the GM1 was launched we felt its 12-32mm kit lens made it comparable to a high-end compact camera, and while still true to a degree the f/3.5-5.6 maximum aperture of that optic can't stand shoulder to shoulder with some of the faster lenses found in the latest top-end compacts out there, such as the Sony RX100 III. But less about lenses, more about the images themselves. At the lowest ISO 100 and ISO 200 sensitivities - used when lots of light is available, for best image quality - the raw files exhibit a light grain and a good level of detail, which is slightly muted in the JPEG forms due to processing, but which you will only notice if using images at any kind of scale. The presence of any colour noise is absent at these settings. Push sensitivity a little further and the results are still admirable. A shot of a cat-featured cushion at ISO 800 shows the level of detail possible from this camera, again with the raw file providing that extra dash of detail (despite less sharpening present). Move into four-figure ISO territory and results are typically decent, but it's here that some odd processing begins to happen. A snap of an elk friend on the roadside taken at ISO 1000 shows grain in the raw file, but exhibits blotches in the JPEG equivalent, with patches of purple/magenta/green more visible in the antlers than in the raw file. The overall result is the kind of thing we would expect to see at higher ISO levels than this level. Best advice: stick to the raw files. There's other image-based trickery that can be performed in-camera, including a stack of processing options, such as the Creative Control option on the main mode dial. Here it's possible to select monochrome, isolated colour and a variety of other pre-set visuals - including classic "retro" film looks - straight into your shots. Each shows up in real-time during preview too, so you'll know exactly what you're getting. Meanwhile movie mode gets a boost to 1080p, a welcome improvement from the interlaced capture available on the GM1. Quality is good, touchscreen controls work well, but movie mode does dig a deeper hole in battery life. The Panasonic Lumix GM5 is an interesting and accomplished system camera, but while the GM1 arrived at a time when it could slot into the market and outshine many high-end compacts, the more tech-laden GM5 exists in a different context. The advance of high-end compacts being one point, the existing (and larger) Lumix GX7 being another. Both those alternatives may bite into this particular viewfinder-featured system camera's potential. Saying that, the GM5 builds from many of the highs of the earlier GM1, and if you select the right lens and stick with it - which may sound like an odd comment to make about an interchangeable lens camera - then the GM5 is positioned to beat high-end compacts at a similar price point. The responsive touchscreen controls, super-fast autofocus system and decent overall image quality are also definite highs. It's just a shame the limited battery life remains a low point and the viewfinder isn't the best on offer. If you want a camera with an occasional-use viewfinder to take everywhere then the GM5 is man enough for the job, and paired with a prime lens its small scale should make it the ideal. Disregarding the chosen lens' protrusion, this Panasonic is smaller than a Fujifilm X30 compact, which will speak volumes to some. It's not as standout as the original GM1, but the GM5 has its moments and that makes it a mini marvel.